the road to syracuse | It's Not Funny Anymore. Last week my friend Jill was in town and she had to drive from Houston to Syracuse, so I went along with her to share the driving and hopefully have an adventure. We got a leisurely start to the drive, setting sail early afternoon on Wednesday. I learned from billboards that Beaumont has been gushing with fun since 1901. They failed to note, however, that the fun stopped gushing in 1943 when oil production slowed and race riots broke out. I also learned from some billboards that Orange, TX is full of culture, history, and art. I’ve heard a lot about the art happenings of Orange, and it’s rich maritime and lumber history is well known, but Jill informed me that she knows for a fact that Orange, TX is not a cultural hotspot. We stayed somewhere in Alabama for the night, and got an early start on what was to be a very long day two. There wasn’t a whole lot to see for quite some time, but we were headed, with great anticipation, towards the Appalachian Mountains, stopping periodically to buy gas station coffee and the gourmet, quality, low sodium, healthy snacks that are readily available in the heartland. We took a musical time machine back to high school, and listened to some all-time deep and meaningful pop-punk and emo albums for several hours. Unfortunately, I was there on a Thursday, and was not able to raise any extra funds. When I showed that picture to Jill, she felt left out, and remarked how she wished she had something to show for cash. It didn’t take her long to realize that there are several different professions in which women are able to show something for cash in various capacities, and that they seldom have the need to do so in a gas station bathroom. Driving through the Bible Belt is weird. There’s a bunch of big crosses on the roadside, churches everywhere, billboards about your personal salvation, etc. Thusly, it was fun and appropriate that we listened to Julia Sweeney’s Letting Go of God. It’s not exactly a laugh riot from start to finish, but it is interesting, and it gave a good satirical vibe to the setting. If you haven’t heard it, it’s worth a listen. And I saw this guy in Chattanooga. It’s some kind of fly, but it was as big as a hummingbird. There’s a point somewhere before the Appalachians where, as Jill identified, the hills are successful at keeping out new ideas—or anything new for that matter. We drove for several hours seeing exclusively towns that had been named after existing places: Glasgow, Buena Vista, Lexington, etc. There were also places that little kids and people who can’t spell had named, like Grossclose and Eutaw. We drove for what seemed like forever on Thursday. When it was absolutely necessary to get some food we weren’t close to anything, and we had to stop at a Taco Bell, and modify menu items to make them vegan(ish). I had assumed that we would go in to eat, and Jill mentioned something about wanting to sit down for a minute; by the way she said it, she sounded like she wanted to go in and meditate or something. Seemed like a stretch, but I know that some fast food restaurants in the middle of nowhere are famous for their rock gardens and general receptiveness to eastern philosophies. Jill ordered first and the middle aged woman taking her order struggled to modify her items, and let us know that she was new… it made me wonder what she was doing before. I looked to the back and saw a country punk girl drop a stack of lids or something on the floor and kick them really hard in frustration. Ordering fast food as a vegan is a total craps shoot, and with our low blood sugar bets on the table we had clearly rolled a big snake eyes. The mountains looked great as we made our way through them in the late afternoon and into the magic hour. More driving, lots of laughs, more driving, and finally at almost five in the morning we got to Jill’s apartment. I caught a few minutes of sleep and headed to the airport. 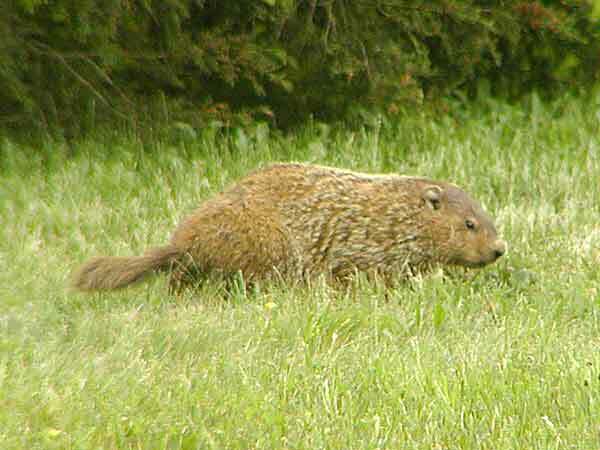 Jill had told me for quite some time about the woodchucks in Syracuse, just as we pulled up to the airport Jill spotted a woodchuck in full gait in the grass, and it was spectacular. With the (much appreciated) help of my friend Chris who works for Continental, I flew back to Houston on a few different planes. I met an old New Jersey guy named Justin on my flight from Newark to Cleveland. He was a lot of fun to talk to. I had way more fun on that trip than anybody could ever hope to have just by driving 1800 miles in two days, and then instantly getting on a plane and coming home. This entry was posted on	September 3, 2008 at 2:00 am	and is filed under bible belt, white trash, woodchuck.